It’s a wondrous spring afternoon. The weather in the manner we Torontonians had been fantasizing about after months of deep freeze. The air is sun kissed and warm. Flowers are at last in bloom as branches sprout fledgling buds. And yet here I find myself cooped up indoors in repose. Race day is tomorrow. Though it’s a relatively short 10K, I want to do well in it. The Toronto Yonge Street 10K overlaps with the route I’ll be racing in The GoodLife Fitness Toronto Marathon in 15 days. So it’s a test run of sorts to ready me for the marathon’s terrain while also helping me to gauge my speed and power — two qualities I have set about studiously to improve. Race well tomorrow and hopes for a strong marathon are buoyed significantly. Race well tomorrow and there will be reason to celebrate. So I prepare today as I will in two weeks’ time. DVD’s of Under The Tuscan Sun and Spirit of The Marathon jockey for position with episodes of The Golden Girls. I’ve readied my race kit and bag check. Visualized the race route and scrutinized the hourly forecast. 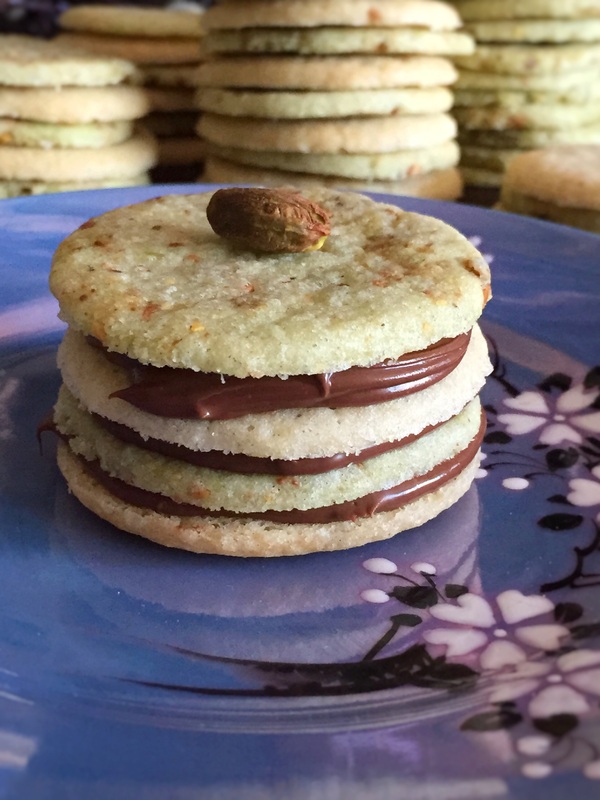 All this while flexing my culinary creativity by baking stacks of sugar cookies mixed alternately with cardamom* and pistachio. And of course, layered with Nutella. Have fun on your run tomorrow! looking forward to the results. I’ll attempt 5K today SLOOOWWW pace to see if I can run yet. Hasn’t this spring weather been gorgeous Rod? I have never run a chip timed 10k before (always been half marathon or more), but did one today with the Barrie Spring Thaw. It is the same thing, you do want to do well with it. It was a fun well organized event, and am pleased with my result. Thanks Carl! And congrats on your race! I was taught to race shorter distances to help me be stronger in my longer distance races. The shorter distances are very different aren’t they? There isn’t the same luxury of warming up through the race. Nor is there the opportunity to make up ground for a slow start. We’ll be participating in the first orienteering even of the season tomorrow morning. The boys are very excited. As for me, i’ll just be wandering aimlessly in the woods hoping I find the controls. Have a great race Rod! You’ll do great! Is this part of your taper? I Before E Except After C. Mind Over Matter Except After Overtraining.